Central Jakarta Bina Marga Sub-dept. 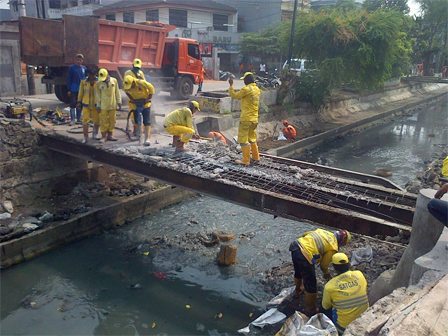 repairs two bridges on Baru Barat River. These bridges connect settlements of RW 04 Kebon Kosong Urban Village and RW 10 Utan Panjang Urban Village, Kemayoran Sub-district.
" We deploy 18 personnel to change its porous plate and missing railings"
These bridges are usually used by local residents as their access to across the river but its condition is not feasible and quite dangerous. Thus it needs to be repaired. Central Jakarta Bina Marga Sub-dept. Head, Sukowibowo explained, his side will install steel plate, conduct casting, and install railing to repair it. "We deploy 18 personnel to change its porous plate and missing railings," he stated, Monday (4/23). He informed, his side needs one month to repair those two bridges. "Hopefully this repair can be finished soon thus residents activities will not be disturbed," he conveyed.